I am sixty- five years old, I have a Beijing hukou (household registration), I am a citizen of Beijing. I have a Hukou Record and National Registration Identity Card. However I have never had a Voter Registration Card. I am neither 1 nor 2; so the only reason that I have never had a Voter Registration Card must be the third one. Beijing came out with a policy this year that only outsiders who have paid taxes for five consecutive years are allowed to buy cars and houses. My question is, will outsiders who have paid taxes continuously for five years be eligible to stand in the election for deputy to the National People’s Congress? 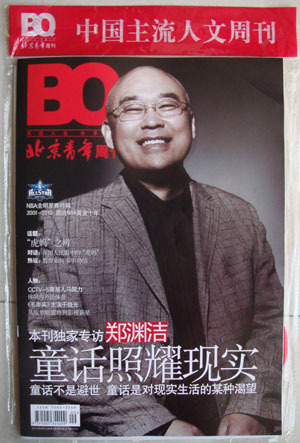 Following is the cover of yesterday’s “Beijing Youth Weekly”. Indeed it looks like I am a psychologically unstable person who is not eligible for Voter Registration Card.